Summary: Unlike dial-up, satellite internet from HughesNet offers you a blazing fast, always-on, secure internet connection that doesn't tie up your phone line. Tired of waiting for your slow dial-up connection? HughesNet brings High-Speed Internet to neighborhoods where DSL and Cable Internet don't reach. Unlike dial-up, satellite internet from HughesNet offers you a blazing fast, always-on, secure internet connection that doesn't tie up your phone line. 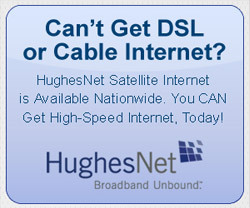 Dial-up can't compete with satellite internet from HughesNet. With over 350,000 subscribers, HughesNet is the leading provider of broadband solutions for consumers and small businesses. Access more content, get more done, and have more fun while eliminating the frustration of dealing with a slow dial-up connection. Plus, every plan comes with complete installation and demonstration of your new, easy-to-use system.